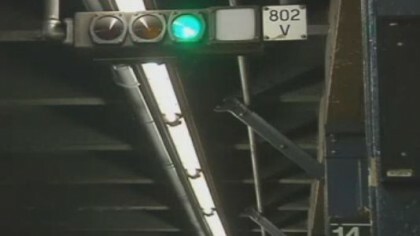 This weekend — Friday evening, April 5 to Monday morning, April 8 — is a “green light” weekend, as there are no planned — as always, I stress planned — service changes directly affecting service at any local stations. The following work week — Monday, April 8 to Friday, April 9 — things get a little more complicated during the late night hours. Each night from 9:30 p.m. to 5:00 a.m. there will be no service in either direction at York Street in DUMBO, as F trains are being re-routed to the Q line between Manhattan and Brooklyn. During these same hours, D trains are being re-routed in both directions over the A line, so there will be extra service at High Street, and the D will replace the F between Jay Street-MetroTech and Stillwell Avenue. There will be free shuttle buses connecting Jay Street and York Street, and also connecting the LES stops on the F with West 4th Street. From Monday to Thursday, starting at 9:30 each night, N trains will be re-routed to the R in both directions between 34th Street-Herald Square and Atlantic Avenue-Barclays Center. This means extra service at Court Street and at the R platforms at Jay Street. Finally, from 1145 p,m, Monday to 5:00 a.m. Tuesday there will be no 3 trains running, but 2 trains should be running normally.